The other day we were stuck inside (snow and sleet outside), and I knew I had to find something for my son to do that would keep his interest and keep him moving. 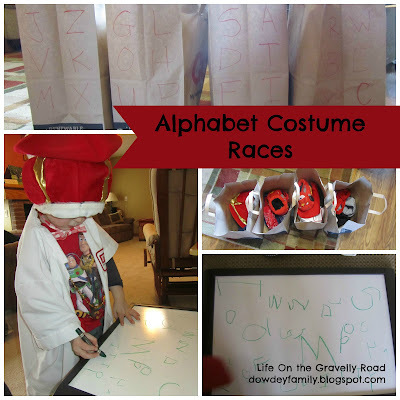 So we played a game we called "Alphabet Costume Races" that was a nice blend of physical activity, learning and silliness to keep his attention. I put a variety of items from the costume box (hats, shirts, capes, etc) into four grocery bags. Then I wrote a group of letters on each bag (we ended up with 6 letters per bag). 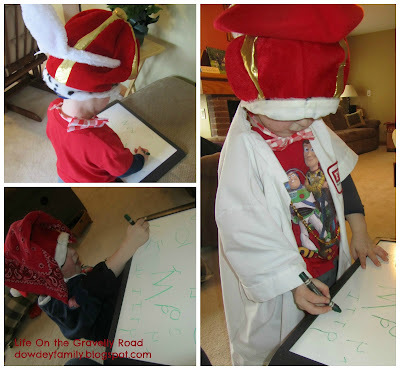 You could also use sight words for older kids. 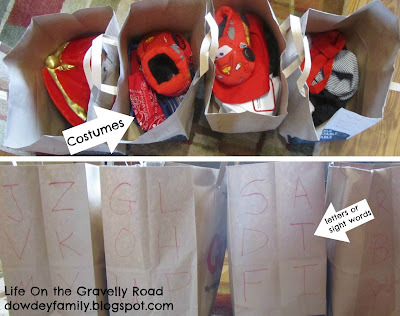 Then I set the letter bags of costumes on one end of the room and I sat on the other end with a white board and white board crayon. Each round my son started next to me. I called out a letter, he raced to find the right letter/bag, put on a costume item, race back to me, and write the letter on the white board. Then I called a new letter and he started again, adding more items to his crazy costume. It was interesting to see which letters he could write quickly (ones in his name, etc) and ones that he needed to glance back at the bag to see how it was shaped. Since each round added more costume items, it got increasingly silly and harder for him to move quickly. 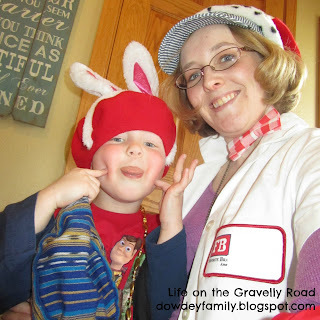 After we were done, we each took two bags and raced to put on all the costume items in them. Sometimes its good just to be silly with my son.